The process starts with the Hot Team concept and follows a series of opportunities for collaboration and assessment all the way around. What is nice is this articulates that it is cool to try something and see if it works … if it doesn’t then we get out. It articulates that a bad idea is OK as long as we know why it is bad. I hope you all like as much as I do. As an aside, the Engage Initiative is working. We have been able to take a dozen or so projects ideas into the cycle and produce not only white papers about them, but we’ve been able to work directly with some great faculty to help us understand where we should be taking this stuff. I wonder how other people get faculty engaged on their campuses? BTW, you have to read about the process Brett and Dave took in creating their award winning poster. Update: I just found out the poster won the Judge’s Choice award at the NMC Summer Conference! 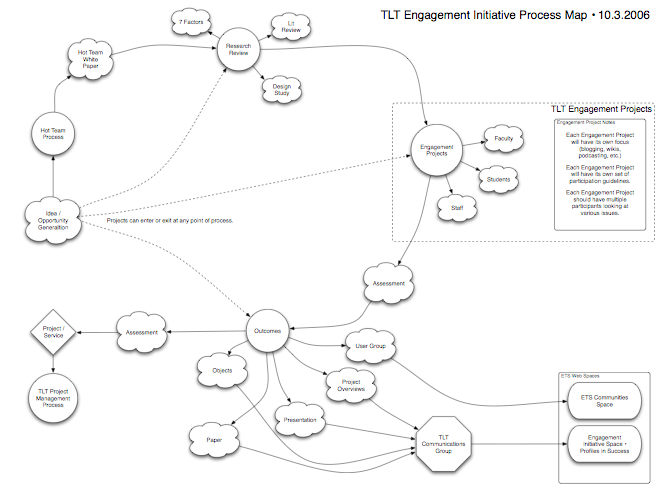 How can we close the loop on the Engagement Initiative projects….that is, show those interested in the Penn State community what others have done, what has worked/not worked etc.? This would seem to be an important step in moving these new technologies from the early adopters to the “cautious triers”. The idea is to build a series of pages that not only shows off the work of the faculty involved in the Engagement Project, but also share the outcomes of the whole process — from Hot Team white papers to student voices to project next steps. We also use the process to help us identify speakers for the TLT Symposium and Speaker Series. If there are other ideas, we are all ears!